This sparkly little toddler bolero was started in March and finished in April – that’s almost a record for me! I actually knitted the pieces quickly (it is a simple pattern and oh how I love making short sleeves!) but I procrastinated over the sewing up and as usual other projects popped up. Unfortunately this is not a great photo – snapped in haste before it went off to it’s new home. So that’s one less WIP in my pile! Yay! Tomorrow it’s back to reviewing another WIP before I knit or sew other ‘stuff’! This entry was posted in Uncategorized and tagged bolero, knit, WIP. Oh despair! I recently started another new project – yes, I know I told myself and everyone here that I would not start something new until I had more finished projects .. there was a good reason for this one though and I used yarn from my stash which justified it. I had a five hour car journey ahead of me. I thought I’d stretch myself, try something a little different. ‘What could go wrong?’ Ha! Lots it turns out! My latest WIP had got to the stage of sewing up. Who can sew up knitting in a car? If there is anyone who can, please give me hints on how to keep pieces straight on my lap and not lose marker pins and sewing needles in the footwell – I am all ears. Note, I’d be the passenger not the driver, of course! I chose a new project over the sewing up this time. I hadn’t made anything lacy in a very long time and realised early on it’s probably because I prefer simple knits. I am using a vintage pattern but am not using vintage cotton and I am adjusting size and shaping. The gauge is slightly off (it grows in length but the width seems ok). I am making it longer than the pattern says so I did two borders rather than one. I went wrong a lot, ripped it back, reknit it. 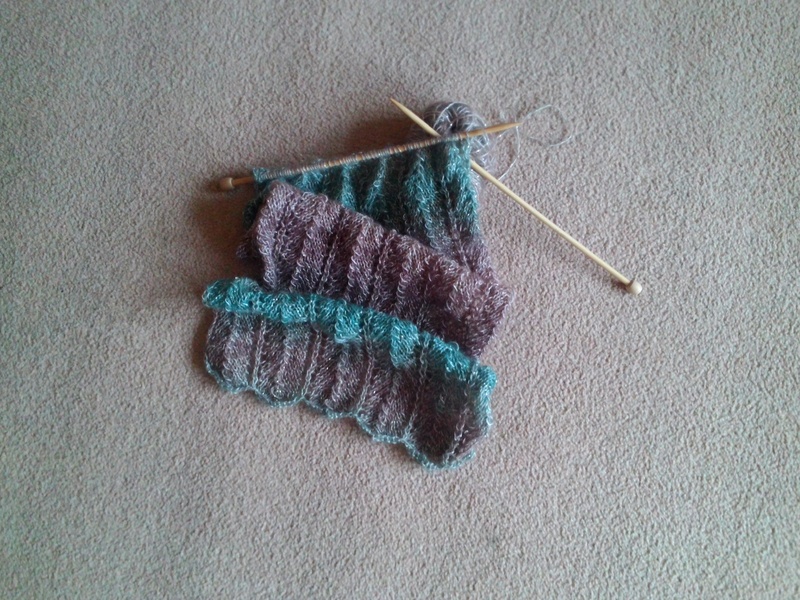 I did not mark off some rows as I knitted, I counted wrong. You name it, I did it! The yellow lines are lifelines, thank goodness I knew about those and had spare yarn with me (of course, I never travel with the bare minimum, not only in my craft bag). I am now onto the armhole shaping. I am a triangle, a lot less wide at the shoulder than Mrs Average (who is Mrs Average, by the way?). Therefore narrowing the shoulder line involves more counting. Whilst the main body lace is easier than the border, knitting when weary means another lifeline after going wrong again, missing out a row, losing a stitch several rows back (how did I not notice? possibly a missed YO somewhere). I think this may be one of those projects that will take a long time. Note to self, future car journeys, knit small and easy! Our final destination was to our house in France. We had a glorious weekend of sunshine and R&R, despite the knitting calamity on the way. Since then, we had a wedding to go to back here in the UK. These fairy lights are just a snippet of the day I wanted to share here. Fantastic day, lovely party, love a wedding! This entry was posted in Uncategorized and tagged craft, fairy light, knit, sew, WIP. It’s been a busy few days, woolly-wise. One baby jacket finished (loved doing the fluted bands!). A pair of booties have hopped off the needles too. The new baby in the family arrived yesterday and the gifts are ready – she was little so she might even fit into the prem baby cardigan and hat I made in a hurry just before Christmas when we were warned she might have been on her way. So today it’s back to my other WIPs. The weather has turned bitterly cold so I have a great excuse to sit in the warm with pins and yarn and not venture outside too often. I am feeling proud to have finished something speedily (not the usual for me!) and I wish fellow crafters equal success with their current projects. This entry was posted in Uncategorized and tagged baby, crafters, sew, WIP, yarn. I realised when revisiting the list of things I intended to do last year that I’ve achieved many parts of that list. What I called my ‘Enthusiasms’, aka as ‘Resolutions’ did not fail for once. I reached my diet goal and along the way my focus changed to become healthier and happier rather than just a little slimmer. I intended to sort out my craft stuff. This year I used up my stash when I could. Just a few samples – I knitted a bunch of hats for charity. Quilt pieces and bunting evolved from my fabric pile, some of which I’d saved since 1994, I even made a sample dress from a duvet cover found in a charity shop (a challenge from friends, see below!). I have many knitting and sewing WIPs. One HUGE intention was to finish many of them in 2018 – or rip them back to reknit something else. I did some of this! I hated two cardigans I eventually finished – both wrong shapes for me so I gifted them and they were gratefully received. I ripped back three unfinished knits. One turned into hats. The others await 2019. For Christmas I received a book about how to knit to flatter – I think this may get good use this year!!! I don’t usually make toys but have a bunny fabric pattern – that’s one intention for 2019. Another is to finish at least one quilt (there are two part done!). I loved the yarn, I loved the pattern, I loved the buttons – sadly it didn’t fit me, but it did fit a friend! I didn’t exactly sort out my job/career. I haven’t leapt into anything in a blind panic. I have put my family and my health first this year. I didn’t juggle all the balls of life and succeed with none. No regrets. The last on last year’s list was to become more involved in day to day household accounting/finance. This was a serious plan for 2018 and is ongoing. I muddle along yet our household finances are still primarily organised by my husband. I wanted to take some pressure off him but we agree he is just better at it. As long as there is ‘change’ after the bills are paid and I can add to my craft supplies I’m happy. I am hoping if he reads this he agrees – happy wife/happy life! This entry was posted in Uncategorized and tagged fabric, knit, quilt, sew, WIP, yarn. I am having a play this week with my fabric stash. I have a beautiful selection of blues and I would love to make a new bedcover for a guest room. I have been hanging onto some of this for years, waiting for an idea to come to fruition. This is a start, it will be ongoing amongst all my other WIPS. I am not a proficient quilter but I am gaining knowledge and momentum (and also gaining the odd headache as I cut incorrectly or realise I prefer some fabrics to others!). I would love to see others current quilt projects this week. Anyone? This entry was posted in Uncategorized and tagged fabric, quiliting, quit, stash, WIP. Today, a gorgeous sunny Sunday here in Kent, I am wearing a cotton summer top I knitted last year. I loved the cotton I knitted with (Paintbox DK from Loveknitting.com). When the back and front were finished I sewed it together and finished the armholes and neck. The neck looked awful, lumpy and bumpy, not a good finish! It is often more difficult to get a neat finish with a cotton or cotton mix, based on past experience. I added some extra rows and attempted to make the neck edge roll back on itself to neaten it up. I had an idea that if I added a lace trim it would enhance the neck and be a ‘feature’. I should have ripped it back there and then but I didn’t. So I tried the top on …. I have no idea why I waited until the final furlong. It fits badly. It is too snug in places, but too wide across the shoulders and chest (think of me as a lumpy triangle, narrow on the top, getting wider across the bottom (!). This is not a flattering photo, deliberately to show off a bad knit, ha ha! It’s the top’s first foray into the limelight. I am wearing it with some fabric shorts I sewed in February this year (love the shorts and they fit well). I have just been in my garden enjoying the sunshine. I could have gifted this top straight away to someone else or to a charity shop, however I decided to wear it and work out exactly what I shall change when I made Version 2. Such an easy knit. Such a dumb mistake. I have plenty more yarn to make a different size or a striped one, minus the lace, with a different neck finish. Wish me luck! This entry was posted in Uncategorized and tagged knit, Paintbox, sew, WIP.